This lesson consists of presentations by nine professionals from NOAA and NASA recorded at the GOES-R Workshop for Broadcast Meteorologists at Kennedy Space Center. 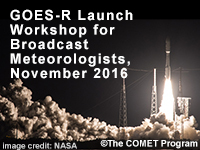 The workshop was offered by StormCenter Communications, Inc. in partnership with the COMET Program in conjunction with the November 2016 GOES-R launch. These presentations introduce broadcast meteorologists to the new capabilities of this next-generation weather satellite and cover topics including new instrumentation and data available via the GOES-R series, and how the imagery will improve forecasting. After completing this lesson and passing the quiz, students will receive a certificate which can be used to document continuing education credits toward maintaining certification for the AMS CBM and NWA Seal of Approval. Pretty good stuff. A little bit prolonged for the actual contents. In some places the questions/answers really clear things up though. This program is really a good one. There should be some practical work with lecture will improve the understanding. Excellent presentation series for the launching of the new GOES-R satellites! Identify driving factors and key initiatives in the evolution of NWS services including impact-based decision support. Identify key instruments on GOES-R and their functions. Describe basic features of the ground control system. Describe the importance of space weather and the role GOES-R will play in keeping us informed about it. Describe key features and capabilities of the advanced baseline imager (ABI) instrument on GOES-R. Describe key features and capabilities of the geostationary lightning mapper (GLM) tool on GOES-R.
Identify key improvements in GOES-R instruments for such areas as IR imagery, water vapor, and motion detection and how these tools will support improved weather forecasts. Describe key features of GOES-R improved sensors and refresh rates and how these will support enhanced understanding of storm development processes. Describe how the increased data supplied by the GOES-R systems will be managed and accessed through the Max system. Describe key features of Baron Services, Inc plans for delivering GOES-R data.